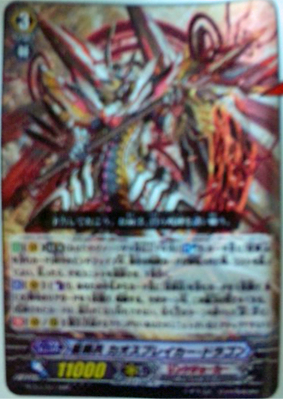 Following a long train of hype surrounding Link Joker's new boss card, Star-vader Chaos Breaker Dragon, his skill has been leaked through images of Monthly Bushiroad magazine. As Kai Toshiki's new key card, Chaos Breaker integrates Link Joker's Lock skills along with the retire aspects of his previous clans Kagerou and Narukami. 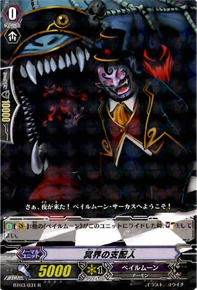 The new unit's skill allows it to retire a rearguard when it is Unlocked and draw a card by eroding at Chaos Breaker's soul, preventing opponents from escaping Lock altogether. 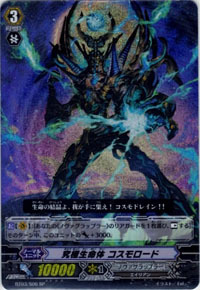 AUTO (V) [Limit Break 4]: [Soulblast 1 cards with "Star-vader" in their name] During the opponent's end phase, when an opponent's card Unlocks, retire that card and draw 1 card. 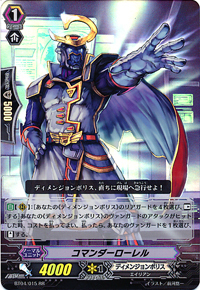 ACT (V): [Counterblast (1) "Star-vader" and discard 1 card with "Star-vader" in its name from your hand] Choose one of your opponent's rearguards and Lock it. This ability cannot be used for the rest of the turn. 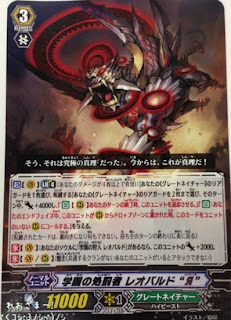 Chaos Breaker is expected to carry a heavy impact on professional play, as prior to his debut Link Joker has been very reliant on the Infinite Zero Dragon break ride to achieve consistent field control, and his ability to retire Unlocked units is very destructive to the currently Reverse-centric Japanese competitive scene. At present there are two types of Reverse units that have shown themselves to be best all-around units in tournament play and preliminary testing. The first type are cards like Luquier “Я” and Cocytus “Я” that give +1 card advantage per counterblast spent, but are based on limiting that advantage to the manipulation of specific zones and rearguard skills. They get their mileage out of Lock by capitalizing on the fact that Locked cards open at the end of their owner's turn. Being able to retire the cards that the opponent's Reverse card Locked changes this, negating the +1 that Luquier and Cocytus “Я” achieve and instead giving it to Chaos Breaker. 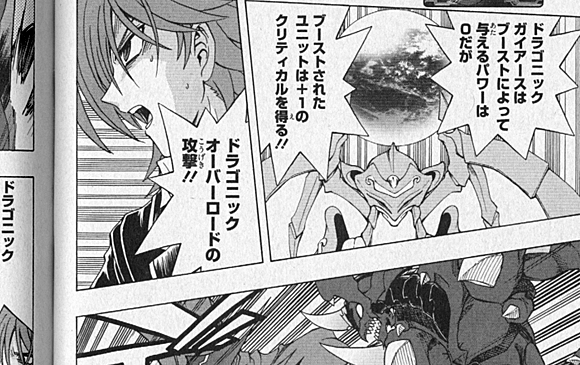 The second type are cards like Vowing Saber “Я” and “Я” Daiyusha, which Breaker has an even better matchup against. This is because these units are reliant on Lock 2 skills to achieve overwhelming power. Normally, Vowing Saber uses his Lock 2 to retire 2 of the opponent's rearguards, which works out to a -2 to the opponent with only counterblast cost once the Locks open. 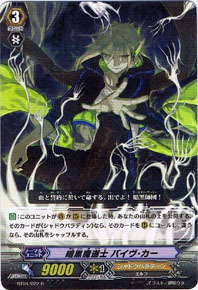 “Я” Daiyusha doesn't directly take away the opponent's card advantage, but by decreasing the opposing vanguard's power he functionally forces the opponent to drop one more card per attack to defend successfully so that they incur a -3 each turn. Chaos Breaker breaks the formula because now Vowing Saber takes a -2 equal to the opponent's -2, and Chaos gets to draw 2 cards to replace the rearguards that Saber retired, while Daiyusha's impact on the game is similarly mitigated to a -2 for Daiyusha vs net -1 to Breaker. Using Reverse card skills no longer becomes sustainable because more resources are lost through using them than are gained. The use of those skills is likely to drive Chaos Breaker's cardfighter to limit break in the first place, enabling his counterplay. Furthermore, Vowing Saber and “Я” Daiyusha normally choose their vanguard booster as the primary sacrifice for their Lock 2 skills, because Saber gets +10000 power to go for 21-23000 unboosted and Daiyusha's Tyrannus Gravity has a functionally similar effect. Chaos Breaker's retire skill takes away those vanguard boosters, so that in either case Reverse cardfighters need to use their limit breaks just to attack at normal strength rather than to power up. This narrows down their resources even further when Breaker limit breaks again, perpetuating a vicious cycle that makes Chaos Breaker Dragon into a hard counter to Reverse cards. 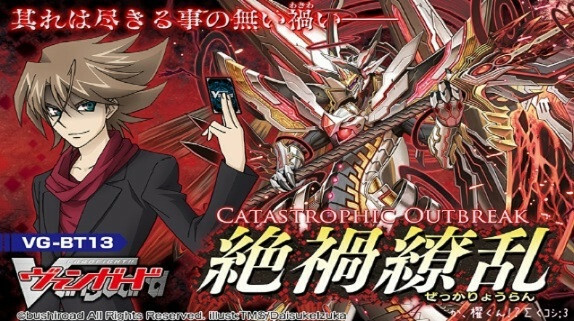 Bushiroad has gone all out in making Reverse cards some of the best choices to build a deck around within their own clans, which suggests that Chaos Breaker will be a format-defining unit not just during the release of Catastrophic Outbreak, but also through future booster sets. 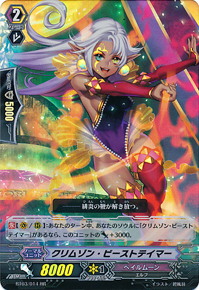 Following the crowning of Japan's current national champion, Bushiroad has announced the beginning of Fighter's Climax 2013, which will form Japan's Winter national tournament for this year. In the open class division, the top cardfighter from each shop qualifier will receive an invitation to their corresponding regional tournament, after which they will have to register online. The winning fighters from each regional will then go on to the national finals, similar to the model used during the American Challenge Cup. Meanwhile, fighters in the junior tournaments will not need to win at a shop qualifier, instead appearing at their regional to register on the day of the tournament. Only elementary school cardfighters born on or after April 2nd, 2001 can participate in the junior tournaments. Each round will be best of 1, with 20 minute rounds, like in the previous five national tournaments. Those participating in Fighter's Climax 2013 will not be able to participate in the VF High School Winter 2013 team tournaments taking place at the same time. The current rules for VFHS require all three team members to be from the same school, with participation open to any elementary, junior high and high school students. Students attending special needs schools will also be able to participate. If for any reason one fighter cannot participate on their team after it has registered, up to one participant may be changed out for another under the conditions that the new fighter is from the same school as the other team members. Regional tournaments will be starting up October 6th and ending on December 12th. Currently eight regionals are planned, going to Hakata, Sapporo, Kanazawa, Sendai, Nagoya, Okayama, Osaka and Tokyo. Unlike FR2013, Kyoto, Fukuoka and Hiroshima will not be part of this coming tournament. It appears that Bushiroad's currently strategy is to cover those cities during the Summer championship, then swap them out for Winter. 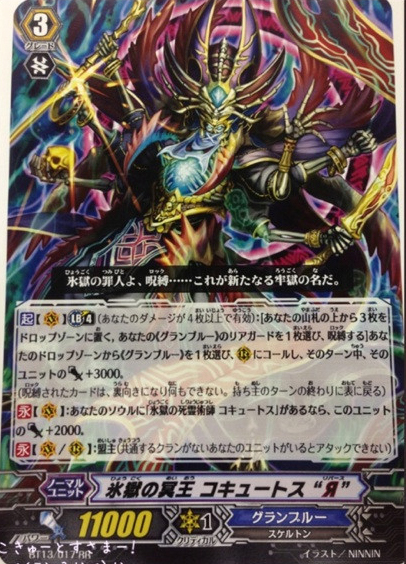 This morning Bushiroad revealed a series of cards following the showcasing of VG-EB07: Mystical Magus in a Nicolive broadcast, attracting over one million visitors. 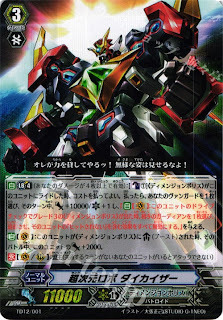 After the display on NicoNico Douga, Doctor O later uploaded higher-quality images of the cards to the net. Among those shown were two new Reverse cards, for Granblue's Cocytus and Great Nature's Leo-pald, the latter of which had been teased by Doctor O on Twitter the night before. To cap off the event, Nova Grappler's new crossbreak ride Ethics Buster Extreme was shown in full, bringing their strategy full circle with a new version of Asura Kaiser's skill. 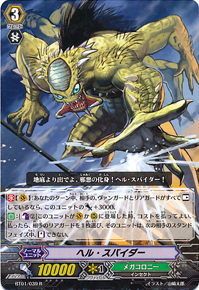 Cocytus in particular has drawn attention for comboing with Granblue's Card of the Day, Banshee Strolling Under the Sea, a Granblue incarnation of Dindrane with which Cocytus “Я” can use to quickly grab up card advantage through a +2 and create a 9000-power booster in the process. 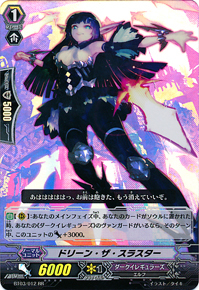 Activate (V) [Limit Break 4]: [Put three cards from the top of your deck into the drop zone, choose one of your «Granblue» rearguards and Lock it] Choose a «Granblue» from your drop zone, call it to (RC), and that unit gets [Power] +3000 until end of turn. Continuous (V): If you have a "Ice Prison Necromancer, Cocytus" in your soul, this unit gets [Power] +2000. 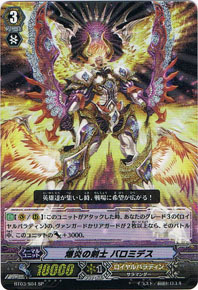 Activate (V) [Limit Break 4]: [Choose one of your «Great Nature» rearguards, and Lock it.] Choose two of your «Great Nature» rearguards, those units get [Power] +4000 until end of the turn, and those units get "Auto [R]: During the end phase of your turn, retire this unit," "Auto: During your end phase, when this unit is sent from (RC) to the drop zone, call this card to an (RC) without a unit." Continuous (V): If you have a "School Hunter, Leo-pald" in your soul, this unit gets [Power] +2000. 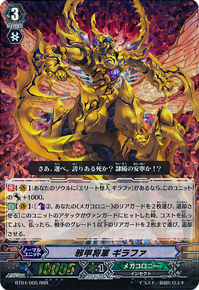 Auto (V) [Limit Break 4]: When this unit drive checks a grade 1 or greater "Beast Deity," choose one of your «Nova Grappler» rearguards and stand it. Continuous (V): If you have a "Beast Deity, Ethics Buster" in your soul, this unit gets [Power] +2000. After a somewhat slower start late in this tournament season, the Link Joker clan has clawed its way to the top in the Pitarui Vanguard Championship. The news comes as a pleasant surprise to many, as Link Joker has consistently placed inside the top 8 at previous VGCS and regional qualifiers, but this is the first time that it has actually taken first place in a large tournament environment. 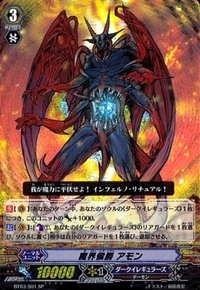 While the Nebula Lord deck in particular has been integral to the upper echelons of professional play since its debut in early July, in part due to overdependence on the Infinite Zero break ride, Link Joker decks have experienced trouble in attaining the same status as contemporary builds like Alfred Liberator and Luquier “Я,” the latter of which recently gained fame as the deck of Japan's 2013 Summer national champion. As there has not been much time to refine how the build is played compared to its competition, this most recent VGCS may indicate the maturation Link Joker's Lock-based play style into a more calculated strategy. Notably, unlike past tournament Link Joker decks where 6 critical and 6 draw triggers were the norm, this new one is being reported to run 8 draw and 4 critical triggers, likely playing to a more long-term game that uses Lock to prolong the match. Second place in the tournament went to an Eradicator cardfighter. So far it has been reported that the top 16 consisted of 4 Link Joker, 3 Eradicator, 3 Revenger, 1 Spike Brothers, 1 Pale Moon, 1 Bermuda Triangle, 1 Genesis, 1 Gold Paladin and 1 Kagerou cardfighters. The total attendance of the tournament is unknown, but accommodations were made in preparation for up to 64 participants. First place prize was a Nintendo 3DS LL handheld, second place a normal 3DS, third place two boxes of VG-BT12: Binding Force of the Black Rings and for fourth place one box of the same. The entire event, from the opening to the awards ceremony, lasted seven and a half hours, and it was organized by the FR2013 Nagoya runner-up. The official Japanese Cardfight portal updated with the decklists from the now-complete FR2013 national tournament, Japan's summer championship for this year. 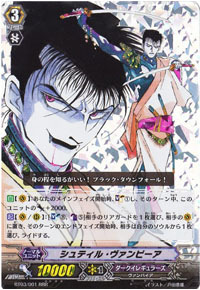 The fifth national champion is Pale Moon cardfighter Kokubo Hikaru, who is also the Asia Circuit Memorial Tournament regional champion for Nagoya, having qualified to participate with a Dragonic Descendant deck prior to the card's restriction, and then subsequently abandoned the deck after the institution of the modern restricted list in favor of Luquier “Я.” Fittingly, the runner-up in FR2013 is none other than Uemura Shouhei, the cardfighter who opened this tournament season with his worldchanging Dragonic Descendant build that has defined the Eradicators throughout this season, and Uemura has stuck to the deck since then. The cardfighters who opened the Fighter's Road 2013 national championship have now brought it to a close, and for the first time in Japanese history the national champion is not a Royal Paladin cardfighter. 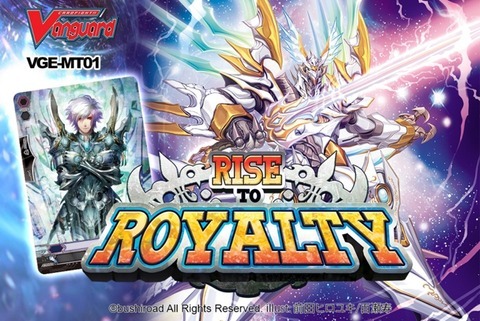 In fact, this is the first time ever that Royal Paladin has not been in Japan's top 3, and in a serious turnaround, Shadow Paladin has grown from being their less successful palette swap into the dominant Paladin deck of the era, surpassing Gold Paladin in sheer numbers and placing in third for the national finals under the command of Hirago Masaki. Furthermore, a special announcement was made today that the Japanese restricted list will remain unchanged through September. 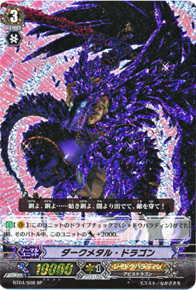 While some were clamoring for additional restrictions to be placed on Eradicator decks, with much attention being put on Cho-ou for how he simultaneously retires the opponent's rearguards and fuels the soul for Rising Phoenix, this decision was likely made in light of Descendant's general decline among Japanese pros following BT12. The rise of Luquier, Nebula Lord, Raging Form and other decks as strong contenders in their own right has deeply upset what was previously a very set-in-its-ways format. Part of Luquier Reverse's success is owed to her status as a hard counter to Descendant. When using Ionela and Irina's skills, what the Silver Thorn build is really doing is calling two units at once, one to a rearguard circle and another to the soul to store for later. 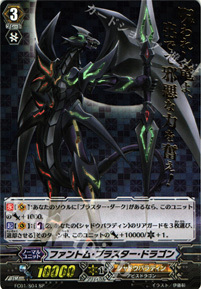 Since the opponent can't retire the soul, cards like Cho-ou and Dragonic Deathscythe that are a strong part of Descendant's early setup fall flat in the long term, as through chainlocking her rearguards in succession, locking 1 to call 1 that she locks to call another, Luquier “Я”'s limit break can let her multiply one card into two, or up to five if she so feels the need to. That kind of strategy may appear overly defensive and not in line with the aggressive format initially, but the Descendant deck relies on the opponent not being able to survive its endgame strategy by swallowing up their hand with Gauntlet Buster or Descendant over two to three turns after taking a field lead. Luquier “Я” doesn't need to call from the hand to call new rearguards after her soul is set up in the early to midgame, so Descendant loses its main feature as Luquier saves up her hand to go for more turns than Eradicator decks can handle. In the Junior championship, the success of the Dimension Police has already been strongly noted through junior champion Niida Kazuki's explanation of the deck earlier this week. 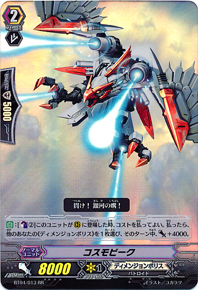 Although Niida was originally shooting for the Doctor O Prize when he created his 15 grade 3 deck, he ended up taking the junior championship trophy unintentionally, using the devastating combination of Enigman Storm's grade security with Daikaiser's break ride to trigger Storm or Daiyusha's skills with Laurel for a self-standing 26000+ power critical 3 vanguard line that used its high grade 3 count to retire perfect defense cards, making certain that the opponent could only guarantee safety if they dropped three perfect defense cards at once against his attack and paid the cost for all of them. 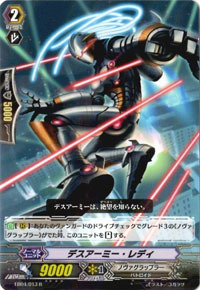 Because of its highly aggressive characteristics, the "Crazy Diamond" deck aims to take the opponent to six damage on turn 4, but because of how it is structured the deck also has an endemic weakness in that once the break ride has been triggered and the vanguard is no longer Daikaiser, if the following turn is survived then the game is over for the Dimension Police cardfighter, as there is no safety net or alternative strategy. Japan's "Fighter's Road 2013" Summer National Championship just finished over the weekend, and Doctor O has tweeted the results. 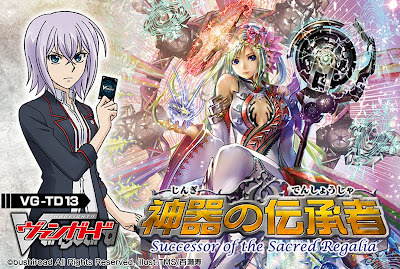 After the extended reign of Dragonic Descendant, and the rise of Raging Form Dragon and Dudley Emperor, the national finals have concluded with the Open class national champion revealed to be a Pale Moon cardfighter that built their deck around Silver Thorn Dragon Queen, Luquier “Я.” Meanwhile the Junior champion is a Dimension Police cardfighter with an innovative Enigman Storm deck, making use of the Daikaiser break ride and a grand total of fifteen grade 3s, much to the shock of Doctor O and the national tournament staff. The identities of the two champions are presently unknown, in part because so many cardfighters have changed decks in the interim period between the regional qualifiers and the national finals. 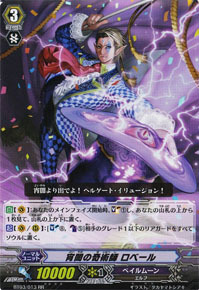 While it is possible that Luquier's appearance here was in response to her overwhelming success at the unofficial Vanguard Championship held two weeks ago, the time frame between tournaments was very short and the actual VGCS decklists were not published in Japan until the August 7th; if this were the motivating factor, the deck switch would have been a very hair-trigger decision. It is more likely that this is a coincidence, and that the new champion chose to use Luquier “Я” having been motivated by the same strengths as Hibari in that tournament. The Junior champion's Daikaiser deck was mainly based around the new Daikaiser break ride, with the Enigman cards as a high-synergy framework. While the official decklists are not yet out, the junior champion has already uploaded their decklist to the internet, along with a recap of the events. He attributed the deck's actual creation to his elder brother, but stated that he originally inspired the build by commenting that "If you break rode Enigman Storm over Daikaiser, it'd be really strong right?" Below is a translation of his deck explanation, with the decklist "Crazy Diamond" below. "No matter how you look at it, the grade distribution is totally different from a normal deck. I went to this number to be able to take advantage of Daikaiser's break ride skill. For the national championship, I practiced with DOTE, Eradicators (Vowing Saber "Я"), and Link Joker but their condition wasn't good enough. At the venue, I brought DOTE, Eradicators and this deck (the completed deck recipe), and after arriving I decided which deck I wanted to use. The reason I used it was "to have fun while playing." Also, I don't practice using proxy cards, so it was my first time reading some of these and the cards released between tournaments became an imaginary enemy, in my head I mean. At the time I began Vanguard I had a goal, to become the national champion and this time it was possible, I am very happy but it feels a little like my feet won't stay on the ground." After being told that Team Caesar would be proud, his father replied, "Thank you very much. This morning, I told him myself. "Congratulations." Listening to that he smiled a little. "But today, Mitsusada was reversed..." (laugh)"
The names of the winners have not been officially revealed, but based on some of his comments the junior champion is being tentatively identified as Niida Kazuki, the current Kanazawa regional champion and a former Kagerou cardfighter known for playing Dragonic Overlord the End. The decklist's name may be a reference to the JoJo's Bizarre Adventure manga. 8/15/2013 Update: The junior champion has been confirmed to be Niida. 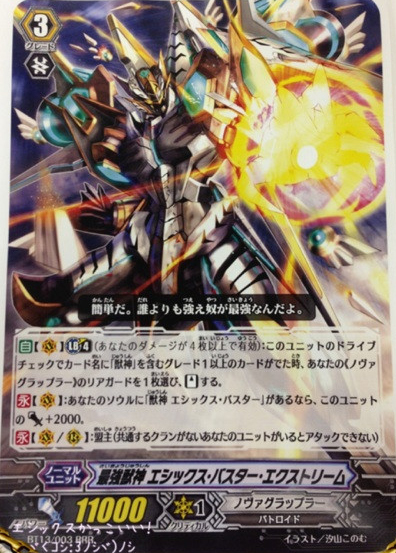 The strategy of the Crazy Diamond deck is to use the evolving Enigman series to compensate for the high grade 3 count, then use that grade 3 count to trigger Daikaiser's skill in every fight, sometimes multiple times per fight. Since Enigman Flow automatically adds the grade 2 Enigman Wave to the hand when the grade 1 Ripple is ridden over it, Niida would deliberately stay gradelocked at 0 if he had other grade 1s in hand but no grade 2, saving up for the scenario in which he would reliably get to grade 3. Furthermore, Daikaiser's break ride skill would let him come back from virtually any amount of gradelock while also automatically triggering Storm's extra critical. 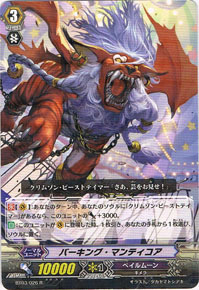 With 15 grade 3s in the deck, Daikaiser would be all but guaranteed to retire the opponent's guardian calls on a vanguard line that was looking to be in the range of 26~28000 power with a critical of 3, dealing 3 damage on-hit after which Commander Laurel would stand the vanguard line that still had 3 critical in addition to its break ride power boost, while giving yet another opportunity for Daikaiser's break ride skill to go off. Perfect defense would not save the opponent because of Daikaiser's guardian retire, and all this was effectively done without triggers. It's easy to see how Niida accidentally won the national championship instead of the Doctor O Prize, as the Enigman cards have not been taken seriously in competitive play for a very long time, setting up his rogue deck to bulldoze over the competition. This morning Doctor O unveiled a new pair of extra booster sets through Twitter, VG-EB08: Champions of the Galaxy 「銀河の闘士」 and VG-EB09: Divine Dragon Progression. EB08 will be released on November 15th, while EB09 will be released on November 22nd. 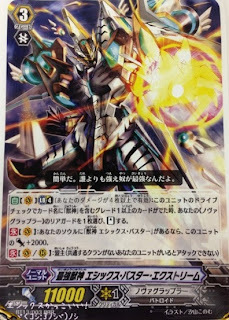 EB08 will feature cards exclusively for Nova Grappler, including long-awaited crossrides for Asura Kaiser and Stern Blaukluger, and cards from the manga. Historically these two were the Novas' primary competitive vanguards prior to the Beast Deities taking over, and EB09 will conclude Asura Kaiser's long search for a supporting grade 3. Described as "the perfect booster for people just starting or have been fans for years!" 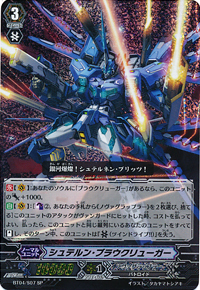 EB08 will allow Nova Grappler cardfighters to build decks "of Real Robots based on the Blau Series," suggesting that these decks will consist solely of Blau support units in a revitalization of their BT04 play style. EB08 will contain 17 reprints with 18 new cards for a total of 35 cards in all. 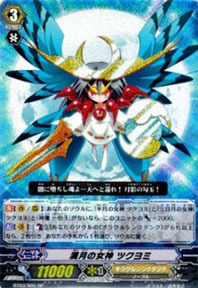 In addition to a crossride for the legendary Asura Kaiser, the set also advertises "friends of Asura Kaiser" pointing to a supporting build for the deck comparable to Stern's. The set will contain 3 RRR/5 RR/8 R/19 C and 4 Special Parallel cards, in contrast to past extra boosters which have only provided 2 SPs per set with 2 RRR units. Like Mystical Magus before it, VG-EB09: Divine Dragon Progression will feature primarily cards from the manga, this time focusing on Kai Toshiki's Kagerou cards from chapters 17-25. Gaiarth Dragon and Cruel Dragon are confirmed to be printed in the set, along with reprints of Berserk Dragon and Bellicosity Dragon. Most surprisingly of all, Kai's grade 4 "Transcendence Dragon, Dragonic Nouvelle Vague" will be printed in the set. Gaiarth Dragon (a portmanteau of "Gaia" and "Earth") was originally known as the grade 2 Dragonic Gaiarth in the manga, and unlike most grade 2s had the boost ability instead of intercept, but contributed 0 power when boosting and increased the critical of the boosted unit by 1 instead. 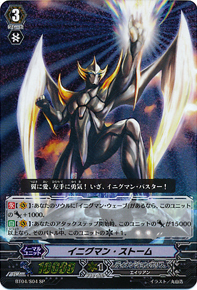 Kai first used this card against Ren in chapter 17, where he used it to increase a rearguard Dragonic Overlord's critical. 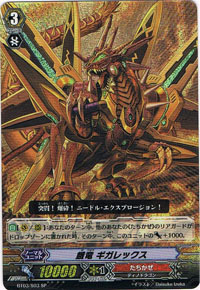 Meanwhile Cruel Dragon was an 11000 power grade 3 that could be superior ridden from the hand when an opponent's rearguard was sent to the drop zone in the main phase, but it would also lose 3000 power for the turn when ridden in that way, so that Cruel would have just 8000 power offensively but then revert to its 11000 power defense on the opponent's turn. 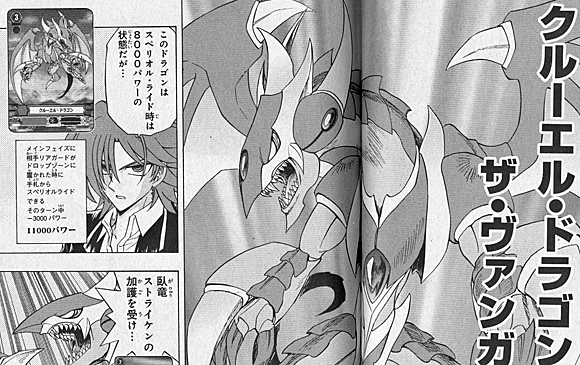 Kai used this again Aichi in chapter 22, as part of a combo with Berserk Dragon, Raopia and Hidden Dragon Striken that would give Cruel a total of 23000 power and 2 critical while Aichi was still at grade 2. Finally, Dragonic Nouvelle Vague (French; Dragonic "New Wave") is the first real grade 4 in the game, predating Silvest. 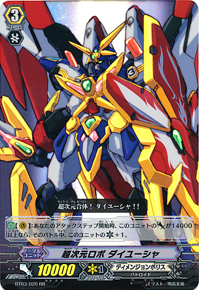 Kai used this unit to defeat Aichi in chapter 22. Like how Gaiarth did not have the intercept ability, Nouvelle Vague did not have twin drive. 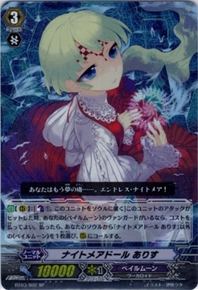 Instead, Nouvelle Vague canceled out both players' drive checks, preventing the opponent from gaining power from triggers, and from healing or drawing as a result of those triggers, and stopping them from increasing their critical through anything but card skills. The unit as it's currently designed is very difficult to use however, because lower graded units cannot be ridden over higher graded ones, so once a grade 4 is ridden there is no going back to grade 3, and consequently once twin drive is lost through riding Nouvelle it is lost for the rest of the game. The unit's base power was never shown, but it is generally suspected to be at least an 11000 power unit. 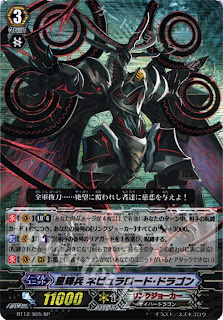 EB09 will feature 23 reprints and 12 new cards, with 3 RRR/5 RR/8 R/19 C and 4 SPs. 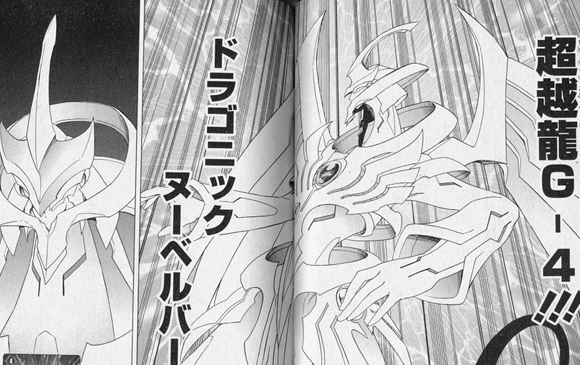 Dragonic Waterfall may be one of those reprints, as it is Kai's finishing card in the manga equivalent to Aichi's Exculpate the Blaster and Ren's Phantom Blaster Dragon. 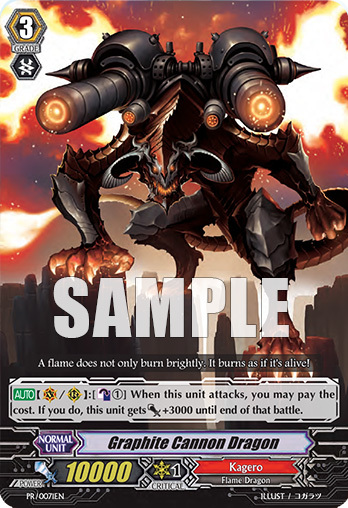 The decklists for the August 3rd Second Tachikawa Vanguard Championship are out, bringing with them a dark horse victory in VGCS champion Hibari's Luquier “Я” deck. Held at Hobby Station Tachikawa, the tournament drew 82 participants in all, with the top 4 being Pale Moon, Revenger, Eradicator and Spike Brothers cardfighters, while the top 8 contained three more Revenger decks, as well as one Majesty Lord Blaster build running 2 copies of Majesty with 1 Soul Saver Dragon, for 3 grade 3s in all. The final matches of the Tachikawa VGCS were uploaded to TwitCasting, a Japanese video sharing website geared towards mobile devices. The VGCS tournaments are a series of unofficial tournaments organized by fans and cardshops. Unlike Bushiroad's larger official tournaments, most VGCS events are done using a best of 3, Swiss tournament model, with entry fees in the vicinity of 1000 yen per person that go toward grand prizes like booster boxes, Nintendo 3DS handhelds and other merchandise. Turnout is typically 70-80 persons, but some events see 100 or more participants, all of whom compete using pseudonyms and internet handles rather than their real names as at official events. Although Japan's current format is known for its extremely aggressive gameplay, early on in the match the Minatsuki v. Hibari finals showed the two fighters dancing around one another considerably, while focusing on one another's rearguards and playing to a very slow buildup, fighting tooth and nail for each point of damage. Hibari showed considerable innovation in how he played his Reverse card, using the Miracle Pop Eva break ride in conjunction with Reverse's limit break to come back from a four card difference, locking two backrow rearguards behind his vanguard and one rearguard line to call two new ones to the front, then attacking with those rearguards and afterwards swapping them in with Eva's break ride to call a completely new column to his then-empty left lane. The Silver Thorn series' quick and accurate soul setup allowed him to prepare a constant pool of new units to call with Luquier “Я”'s skill, calling more soul-charging rearguards from the soul and then locking those units to bring out more opportunities. In the second round Minatsuki became gradelocked at 0, quickly leading to a three-card disadvantage for the Revenger side, but he came back using Tartu and Darkbond Trumpeter's skills to superior call boosters. Even so, this couldn't hold up to Luquier's reliable strategy, so after his surprise comeback in the first round Hibari completely dominated the second, beating Raging Form 2-0. 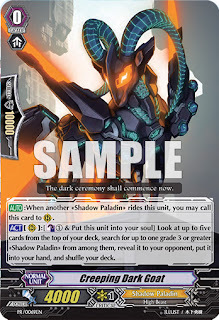 Sources at Bushiroad have identified that the highly anticipated Creeping Dark Goat, the second Shadow Paladin first vanguard to be printed since Fullbau in BT04, will see its English release at the World Championship 2013 Free Fight events. These Free Fight side events, similar to those of Worlds 2012, will be held at each regional to allow those not participating in the main tournament and those that have been eliminated to play casual matches for fun. While all of the regional events so far begin at 9:00 AM and end at 6:00 PM, the Free Fight side events will be starting up during the main tournament from 2:00 PM until 4:00 PM, coinciding with the point when many cardfighters have been eliminated. Although FVGs of Creeping Dark Goat's model have frequently been panned for their inaccuracy, CDG has enjoyed special attention among Shadow Paladin cardfighters for being their primary competitive option, as a free boosting unit that is guaranteed is oftentimes more useful than what Fullbau brings to the table. 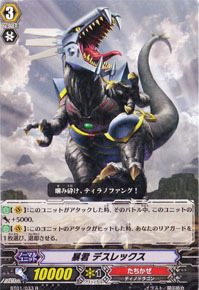 Furthermore, even in Japan where Frontline Revenger Claudas is presently available with more power and a unique skill, CDG is often played just for providing the chance to search for a grade 3. Fighters will be able to earn PR/0069EN Creeping Dark Goat by participating in 4 or more matches in the Free Fight event. 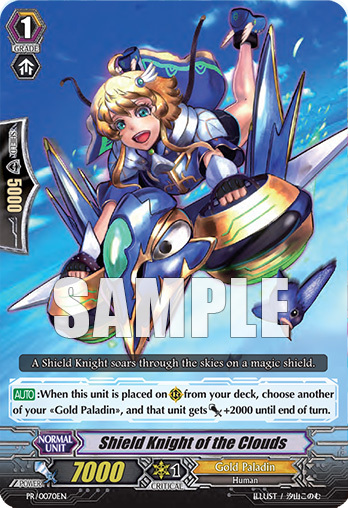 They will also be able to earn PR/0070EN Shield Knight of the Clouds by participating in 2 or more matches. 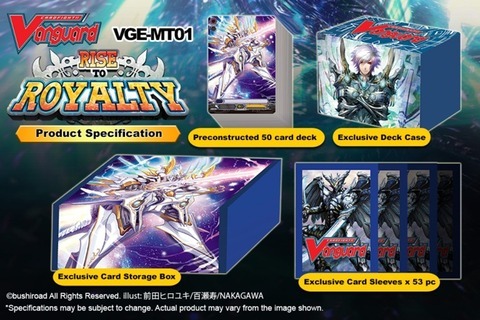 As a participation prize for taking part in the main regional tournament PR/0071EN Graphite Cannon Dragon will be given out, along with a card storage box. This morning the thirteenth trial deck was revealed. 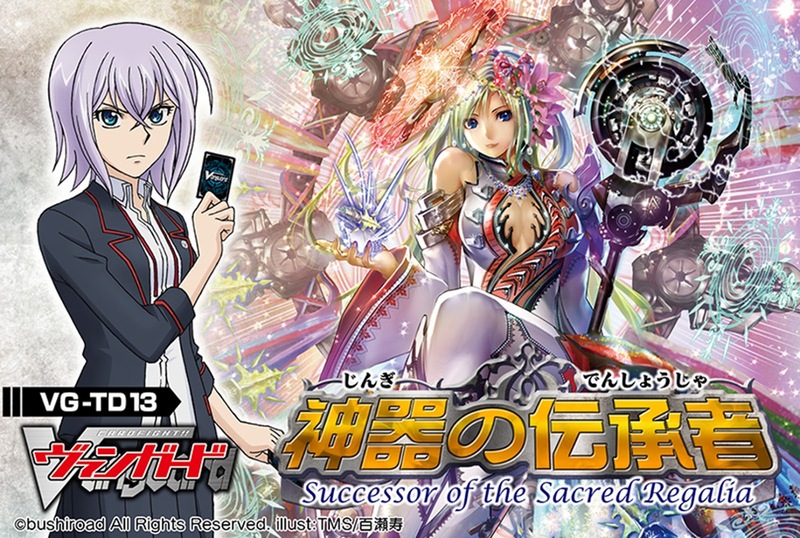 Scheduled to release on October 25th, VG-TD13: Successor of the Sacred Regalia will be a trial deck based around Genesis, Misaki's new clan from the third season of the Cardfight!! 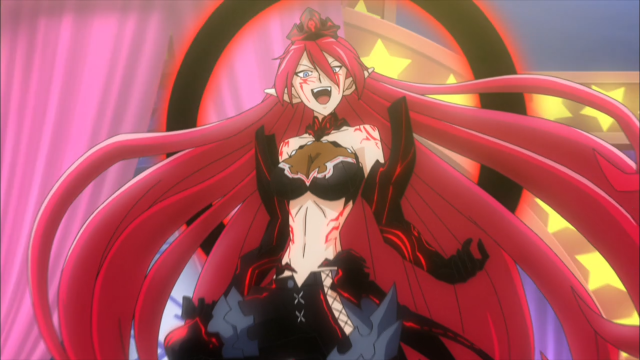 Vanguard anime, Link Joker. While her manga incarnation continues to use Oracle Think Tank, in the anime Misaki has picked up this clan to expand her abilities. The deck will contain a new break ride unit, and will be connected with new Genesis support in the still-untitled BT14. Following the pattern established by previous trial decks TD08-TD11, "Successor" will likely by Genesis' new subgroup. The kanji used for the "Sacred Regalia" in TD13's title is 神器 "sacred treasures," referring to the three imperial regalia of Japan, the sword Kusanagi, the mirror Yata no Kagami and the jewel Yasakani no Magatama which together represent valor, wisdom and benevolence. 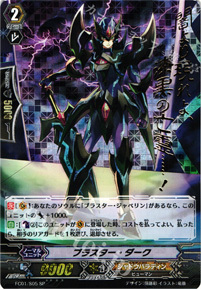 In Cardfight!! 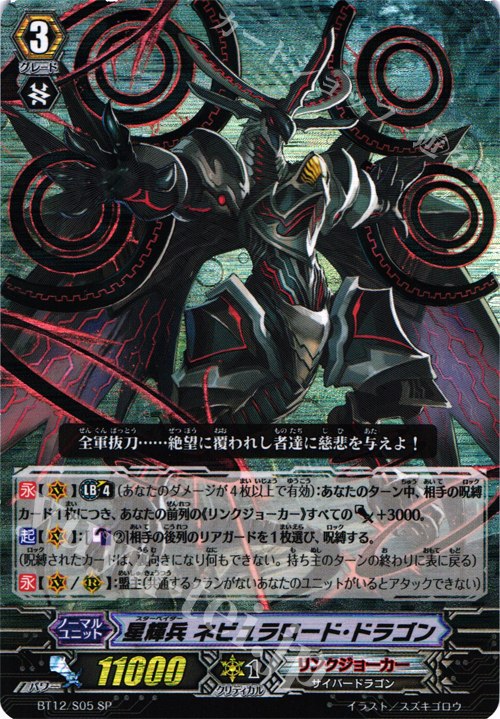 Vanguard the regalia appear to correspond to CEO Amaterasu's Yata no Kagami and Tsukuyomi's Moon Shadow Magatama, but the Kusanagi so far has only been implied as being a part of Amaterasu's Celestial Valkyries alternate artwork, without a named appearance in the TCG. The fact that all of the regalia as seen previously belonged to Oracle Think Tank units suggests that these "Successors" may be new units using the relics of old ones, passing the torch from Oracle Think Tank to Genesis.